Call us for a free trailer inspection! Searching for truck accessories in the Beaumont, Texas? For all the best grille guards, tool boxes, and trailer hitches, choose Trailer Hitch Depot. We look forward to serving you with truck accessories and trailer repairs. When you own a truck or trailer, it's important to schedule trailer repairs every year. Speak to The Trailer Hitch Depot of Beaumont, Texas to improve your truck's appearance with grille guards, tool boxes, and other durable truck accessories. We are dedicated to trailer and truck repair from top to bottom, including spray on bedliners for truck beds that receive wear and tear. Speak to our trailer specialists today. WE NOW SELL NEW TRAILER HITCHES!!! When you combine the knowledge of all the associates, we have over one hundred years of experience. No matter what type of truck or automobile you own, you have to have the right type of trailer hitches to tow any load. What you are towing is considerably heavier than your vehicle. Simply owning trailer hitches doesn't mean that you will tow anything effectively. It is essential to have the right kind of trailer hitches and attach them correctly. When you are towing, it is essential to be able to tow correctly so that it doesn’t pose a danger to you or your fellow drivers. When buying a hitch, it is important to know the towing capacity of your vehicle. The easiest way is to call us here at Trailer Hitch Depot and see how we can help. We have several technicians with many years of experience that will measure your vehicle and give you an accurate estimate. If we see any problems, we'll jump to our tool boxes and fix the problem right away. Hire Us for Reliable Trailer Hitches. We carry a large line of truck and automobile accessories, from spray on bedliners and tool boxes to grille guards. We also have truck lighting, truck brush guards, truck head ache racks and a whole lot more. Trailer Hitch Depot also provides trailer repairs. We can repair your lowboy trailers, horse and cattle trailers up to your gooseneck and heavy hauling tandem and single axle trailer. Not sure what part is broken on your trailer? When you leave your trailer repairs to the experts, we'll be able to tell you whether you need new grille guards or trailer hitches. From Grille Guards to Spray On Bedliners, Give Us a Call Today! Remember, when you are looking for the best truck accessories in the Beaumont, Texas area, we have it all. From truck bumpers to grille guards, you'll be set for life. We keep a very large inventory in stock so we can get you in and out in a short amount of time. If there are any parts in our tool boxes you can't find, we can special order the item. Don't you want to come to a trailer repairs business that knows what they are doing? 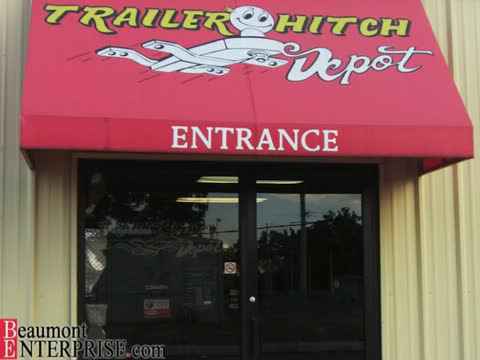 Trailer Hitch Depot in Beaumont, Texas will work hard to get you the best spray on bedliners and truck accessories in the area. We look forward to fixing up your truck and trailer today. Trailer Hitch Depot carries every type of truck accessories that you need. We have trailer hitches, spray in bedliners, tool boxes, grille guards, brush guards, cab racks, bumpers, flares, and trims. Please call if you would like to schedule a trailer repair today. We work in Beaumont, Texas.